The California Housing Affordability Index inched up by 1 percentage point in Q1 2017. Only eight of 43 counties measured reported an increase in affordability. 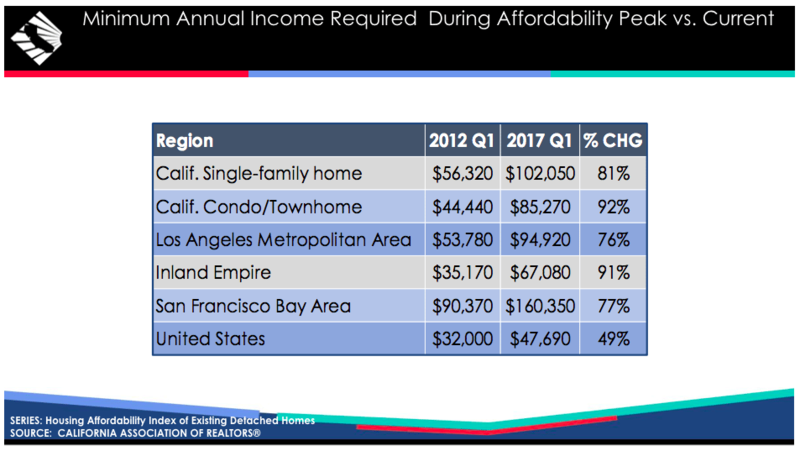 Seasonal home price declines and robust income growth have helped bolster California housing affordability, according to the California Association of Realtors’ Q1 affordability report. Thirty-two percent of buyers could afford to buy a median-priced ($496,620) home in Q1 — a 1 percentage point increase from Q4 2015. This is the 16th consecutive quarter that the Housing Affordability Index has been below 40 percent, and is 3 percentage points away from the 2008 low of 29 percent. The affordability index of condominiums and townhomes was unchanged, and the minimum income to qualify for the purchase of a median-priced $414,940 condo or townhome with a $2,130 monthly mortgage was $85,270. Out of the 43 counties tracked, eight (Los Angeles, San Diego, Merced, San Joaquin, Tulare, El Dorado, Shasta, Sutter) reported an increase, 26 experienced a decline and 9 were unchanged from Q4. The most affordable counties boasting affordability rates ranging from 52–55 percent, respectively, were Tehama, Kern, Kings, Sutter, Tulare and San Bernadino. The least affordable counties were San Francisco, Santa Barbara and San Mateo, all of which had affordability rates ranging from 13–15 percent, well below the state average. This report comes on the heels of the association’s panel about affordability in California, where experts warned that California is on the verge of becoming a majority renter state if something isn’t done quickly. “In a few years, California will be a majority renter state,” predicted California Association of Realtors Chief Economist Leslie Appleton-Young. Experts said lowering the cost of living, lifting certain regulations and educating more affluent residents about the benefits of having affordable, low-income housing in their neighborhood will help improve the situation.